After an hour and some change at the airport and another hour in traffic, we turned left into a narrow alleyway and started questioning whether the driver knew where he was going. Within a few short minutes, we arrive to a gated property and stop right in front of a lobby, where we were warmly greeted with fragrant floral lei’s and a welcome drink. We arrived, after 20+ hours of traveling; we have arrived to a place we were going to call “home” for the next few days. I grew up in the suburbs and live in the suburbs, technically, far enough from Downtown LA but close enough to drive to when needed. This sense of privacy and exclusion from the hustle and bustle of the city is something I crave when I travel as well. While we weren’t too far from the center of Ubud, we were far enough that we didn’t hear anything but the Ayung River flowing through the resort and birds chirping. 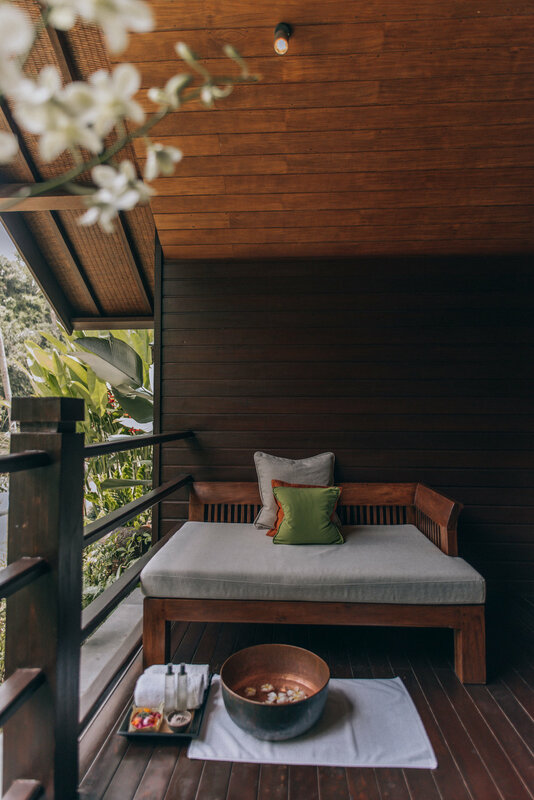 Surrounded by rice paddies and hills, Mandapa offered peaceful days and tranquil nights, with the familiarity of high-quality service that the Ritz-Carlton is known for. 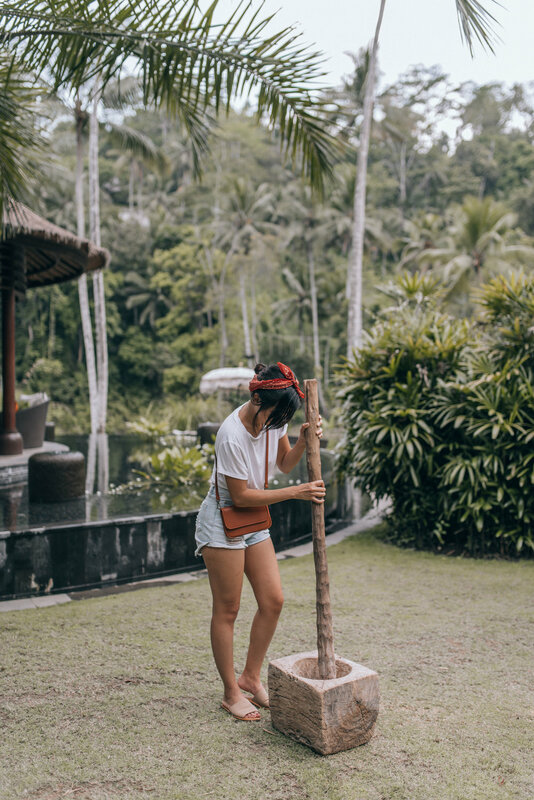 Check-in is quite different at Mandapa and their way was much more accommodating, as they truly care about their guests. We were escorted to our room after we got in, and while settling in, our butler (Tapsir) gave us a little tour of our place. He then sat down with us to begin the check-in process. He pulled out a tablet and gets us all squared away, and then promptly excuses himself so we can relax. Why can’t all check-in services be this way? This was so much more convenient than standing in a lobby, having to wait for your keys, and then wait for luggage to arrive to your room afterwards. After 20+ hours on traveling, I totally appreciated this. Mandapa was kind enough to take care of our stay by providing us an itinerary. We enjoyed room service that first night and then knocked out on the comfiest bed. By the way, isn’t the décor of this place dreamy? Everything was perfect, including the views. Also, I love the high-tech Toto toilet in our place. Who doesn’t enjoy a warm seat in the bathroom? Hah. The resort is non-smoking. However, there are designated smoking areas available. Our next few days there consisted of breakfast at Sawah Terrace, which has all-day dining with a view of the Ayung River. You can see rafters all day and if you’re interested in experiencing it, Mandapa can help you set it up. At night, Sawah Terrace turns into the perfect intimate date night for couples. We enjoyed traditional Balinese dishes and the sounds of the river. 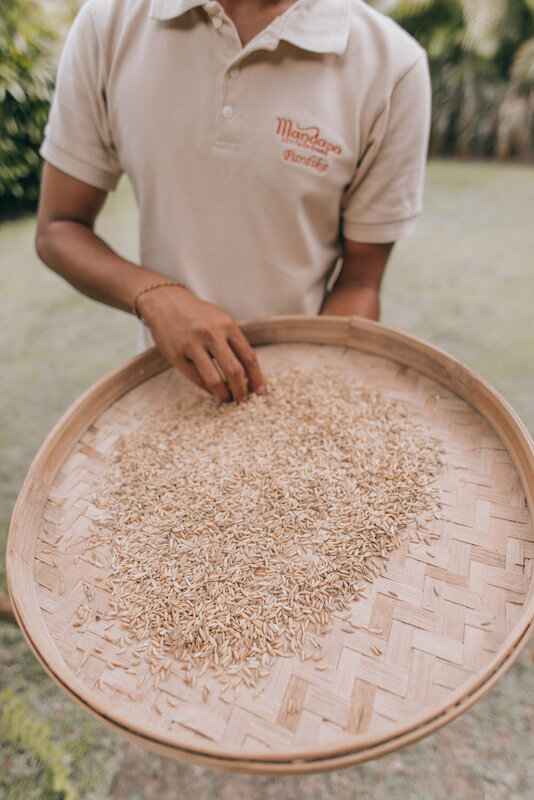 In addition, private dining options are available and we opted for a private picnic at the rice barn, in their rice fields. 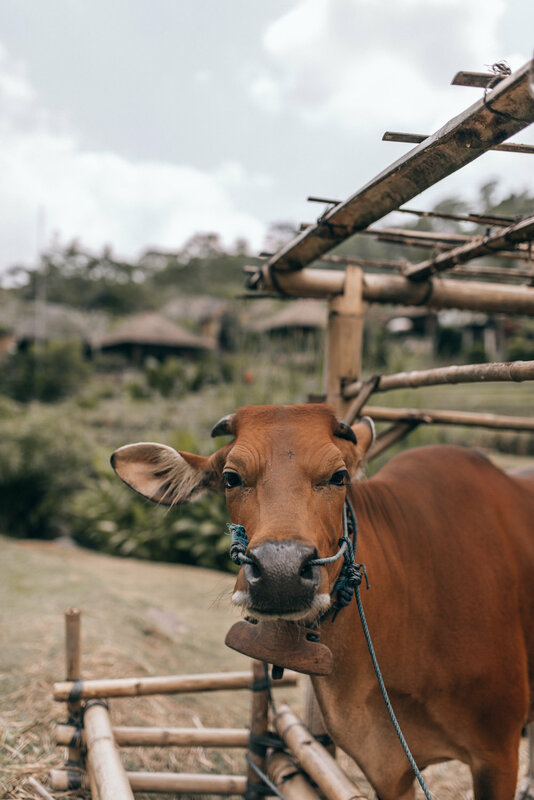 Yes, Mandapa has it’s own rice fields on the property and we were given an educational tour about the history behind it, met Manda (the cutest cow), and got to try our hands at rice pounding. FYI – way easier than it looks. Our picnic included a cute basket filled with a 3-course meal for two, free of anything you’re allergic to and/or customized to your dietary restrictions. We were given a menu of choices prior to the picnic, selected what we wanted, and were asked what we wished to drink once the food was served. Aside from our butler checking in to ensure everything was ok, we were not disturbed once throughout our picnic. We enjoyed the most luxurious couple’s massage, which included a foot bath and 60-minute massage of choice. I was so relaxed afterwards and the oils used were so moisturizing without being overpowering in scent. It is the second best massage I’ve ever received, as my absolute favorite is still Shangri-La in Vancouver. Mandapa comes really close though! After the massage session, we were escorted to the quiet area and provided cookies and ginger tea. It was the best way to unwind. 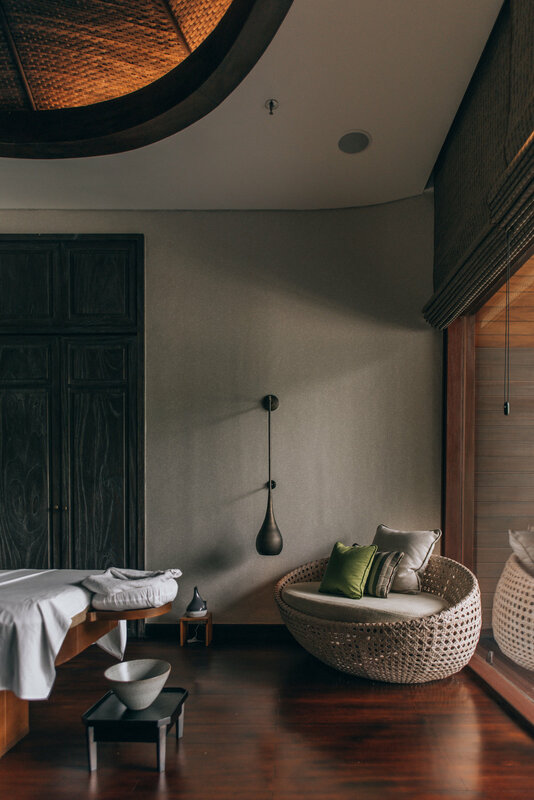 When it comes to resorts like Mandapa, I try my best to stay in the room as much as possible. I love taking advantage of the resort features and amenities throughout the day, but I also love retreating back into my little oasis every evening. There was an afternoon that we were able to just do absolutely nothing for a few hours, in which I decided to request a flower bath service. Our butler happily accommodated us, as I sat and watched in awe at him placing every single flower into the tub, creating a gorgeous heart in the center. 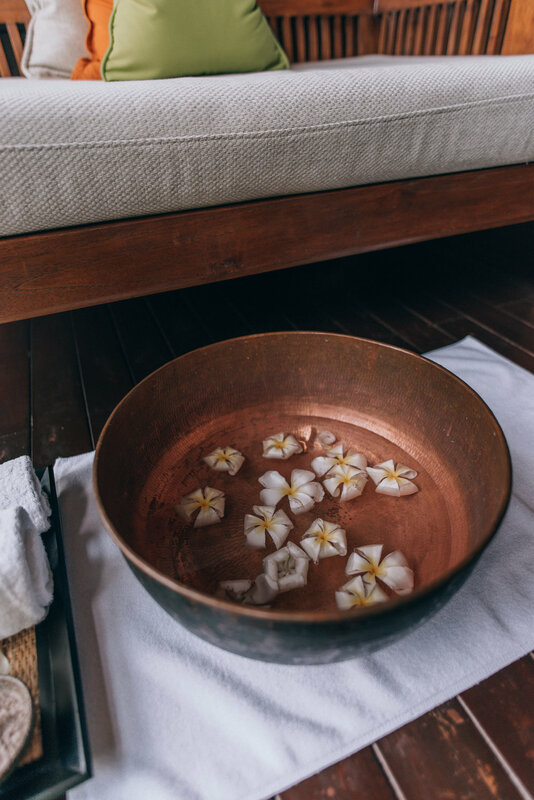 It was my first flower bath and to have it at Mandapa was just magical. 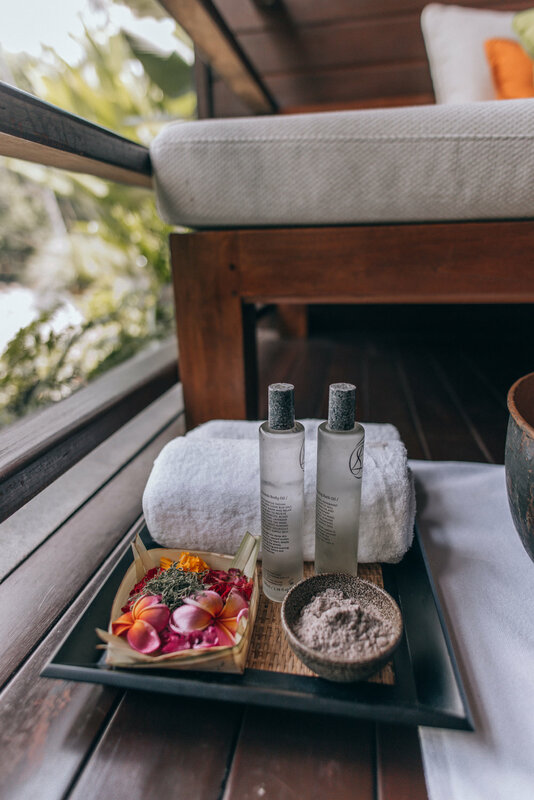 I refused to get any other flower baths throughout the trip, even at the other places we stayed because Mandapa’s experience was just too perfect and nothing else would compare. I mean, just look at it! 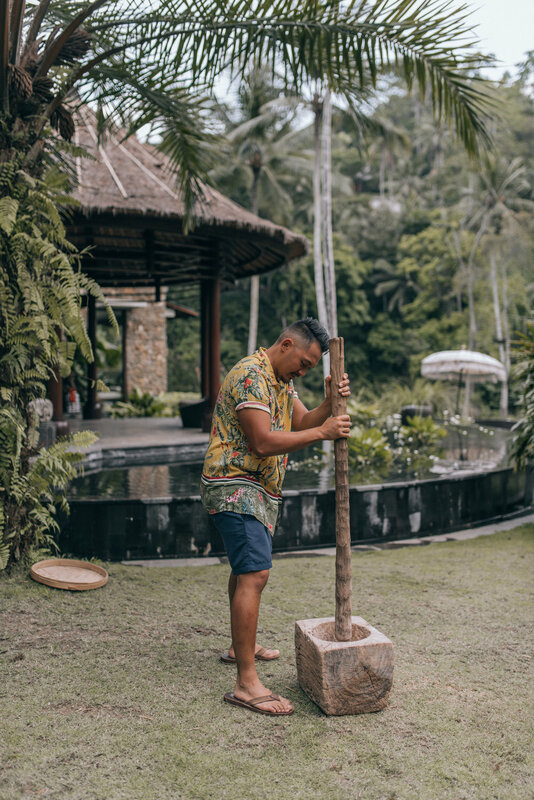 There is so much you can do during your stay at Mandapa, but you can also choose to do absolutely nothing and enjoy the surroundings. With a 5-star resort like this one, whatever you choose to do, is going to be amazing. Thank you Mandapa for providing the best experience, one that we continue to rave about and tell our friends and family! Congrats to Mandapa for also being listed #26 in the Top 45 resorts in Asia this year for the Conde Nest Reader’s Choice Awards!